Thirunelli Temple is an ancient temple dedicated to Lord Maha Vishnu on the side of Brahmagiri hill in Kerala, near the border with Karnataka state. 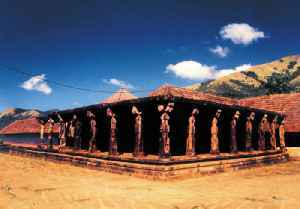 The temple is at an altitude of about 900m in north Wayanad in a valley surrounded by mountains and beautiful forests. It is 32 km away from Manathavady.